With their larger imaging circle we’re all accustomed to thinking how full-frame lenses can be used on cameras with smaller APS-C size sensors, providing the mount is compatible, so it comes as little surprise to see Sigma apply that principle to their DN series lenses. 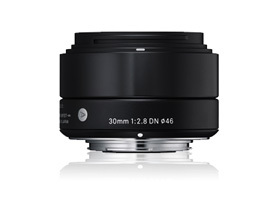 These lenses are designed for mirrorless cameras available with mounts to fit either Sony NEX or the smaller MFT cameras from Panasonic and Olympus. On those cameras the 30mm (please note, we’ve already reviewed this lens with a MFT mount here) is the equivalent to a short tele (60mm) though on an NEX body using an APS-C size sensor it has a more amenable angle of view, equivalent to a 45mm. It has 7 elements (with 2 aspheric surfaces) in 5 groups, focuses to 30cm and weighs just 130g. It’s available now, for $199. On the 24-MPix NEX-7, a camera known for its superb if somewhat uncompromising sensor, the Sigma 30mm performs well given the $199 price. 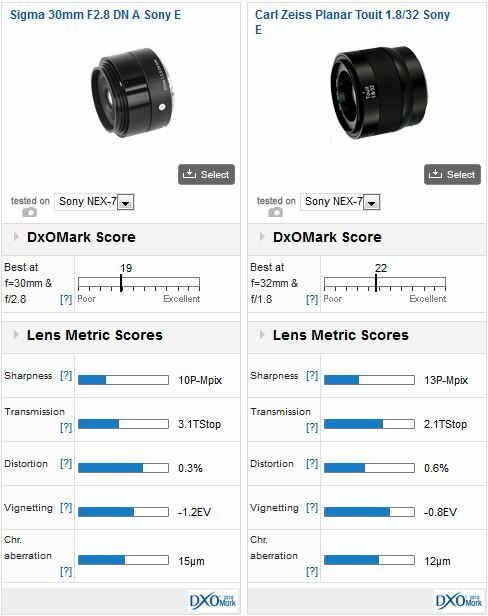 Nevertheless, it isn’t the sharpest, highest resolving lens we’ve seen (the Sigma 60mm f2.8 DN A achieved a 16P-Mpix score on the same sensor/camera model). On the plus side, sharpness is reasonably consistent across the image field. Both vignetting and chromatic aberration (noticeable from 2/3rds of the image field out to the corners) are high for a lens with an f/2.8 maximum aperture like this one. Distortion is mild, though. Compared with the high-end Zeiss Touit 1.8/32, the Sigma has the lower image quality overall. Although the two have comparable homogeneity in sharpness across the field (which could be better), the Zeiss is sharper. Both lenses exhibit slight barrel distortion though the Sigma’s is milder. However, even though the Zeiss is faster it has slightly lower levels of chromatic aberration and far better control of vignetting, though the latter is easy to remove in post. 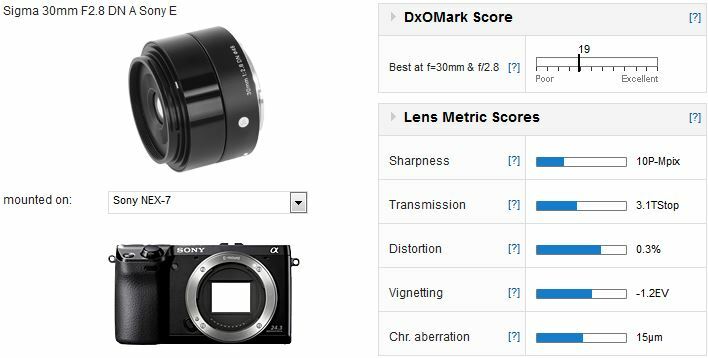 Bear in mind the Sigma is around $650-700 less than the Zeiss. With a maximum aperture f/2.8 it’s not aimed low light shooters but at $199 it looks like good value for a general-purpose standard lens. Sharpness levels are really only average and it has slightly high chromatic aberration and vignetting, though the latter two points can be rectified to a degree in-camera for JPEGs or with software for RAW files.